← Rune Sore-bees: A Dialog by Shelly Berman, and more. I’ve written before and copiously about Sara Lee Frozen All-Butter Brownies. But for a long time I’ve been craving these lost little treats from Stella d’Oro, flower-shaped biscuits that I used to get at my nonna’s house in New York when I was young. Not soft, not crunchy, but with a unique texture all thier own. And they appear to have vanished forever. I have written to Stella d’Oro and begged for a resurrection of this product, as I know many others have done, but thus far our pleas have fallen on deaf ears. And I’d try some in a heartbeat but you have to order them by the case. Other websites sell them by the pack, but at double the price plus shipping, so I’ll have to wait until I can get down to Hackensack to pick up a bag and see for myself, which thing I will not fail to do. Speaking of taralli, let me introduce you to Graziella. 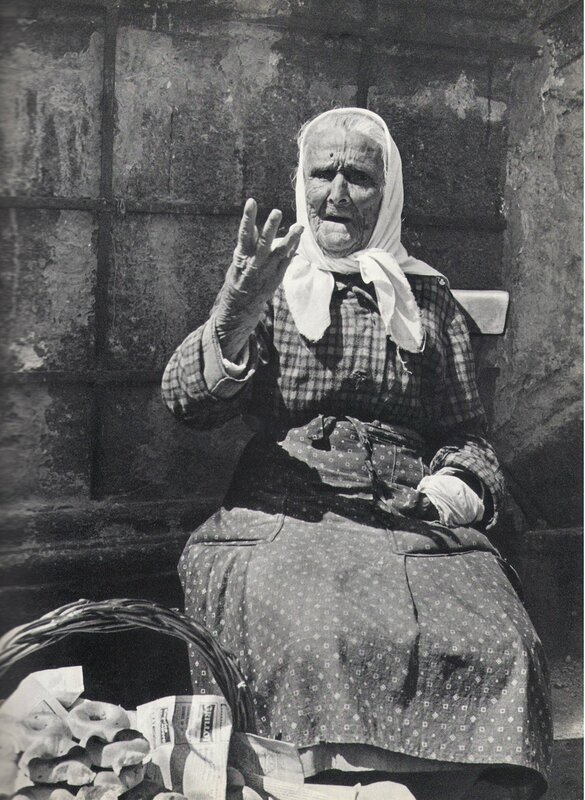 The photo and text below are from The Italians, Face of a Nation by John Phillips, published in 1965 by McGraw-Hill. “When Graziella was born in 1864, Lincoln was President of the United States of America, Napoleon III was Emperor of France, Bismarck was Chancellor of Prussia, Victoria was Queen of England, and Victor Emmanuel II was the first ruler of the new kingdom of Italy. Thirty-nine months before, an ancient civilization had finally become a young nation. though France maintained the sovereignty of the Papacy over Rome, while Austria retained the Italian-speaking provinces of Mantua, Venice and Trento. Graziella was two when Victor Emmanuel took advantage of the Austro-Prussian war to annex Mantua and Venice. On her seventh birthday, after Napoleon fell, her monarch got a special present: Rome. Graziella never did learn to read. Her sovereign was more interested in colonial annexation than in the literacy rate of his people. At eighteen, the cheerful illiterate married a Neapolitan diver. That was the year Italy took her first dip into colonialism and came up with Assab, on the Red Sea. During Graziella’s first pregnancy, Italy signed her first international agreement and joined the Triple Alliance. This pact favored Austria, the hereditary enemy, and benefited Germany, but it did gratify the Italian national pride. The first of Graziella’s nine children was born the same year that a blacksmith’s wife had a son whose name was Benito Mussolini. The birth of Graziella’s second child coincided with the conquest of Eritrea. Then came Teresa in 1892, the year the Italian socialists held their first congress. By the time Assunta was born, two years later, the socialist party had been dissolved. In 1895 Graziella had her fifth child in the midst of national rejoicing – Ethiopia had been conquered, Graziella mourned the death of her sixth child in the midst of national grief over being driven out of Ethiopia. Rosa’s birth preceded the tumultuous riots of 1898, which led to reprisals against the workers who had participated in them. Peppino was born the year Umberto l was assassinated in reprisal for the 1898 reprisals. Graziella’s last child celebrated her tenth birthday the year Italy conquered Libya and Cyrenaica. A year later, in 1913, Graziella went to work to supplement her husband’s earnings. She had been selling fried peppers and eggplant for a year when the socialist firebrand Benito Mussolini tried to start a revolution at the outbreak of World War 1. Mussolini was against nationalism and war. The spring of 1915, Graziella moved her stand next to Zi Teresa, a restaurant on Naples’ waterfront, as Italy switched partners and declared war on her former allies of the Triple Alliance – in the name of “Holy Egoism.” In return, Italy received Trento, Alto Adige, Venezia Giulia, Trieste, and the Istrian Peninsula. Graziella was 58 when Mussolini became a nationalist, and 71 at the time he attacked Ethiopia. She was 75 the year the Duce blustered into World War II, and 80 when he could be seen dangling head down at a gas station in Milan. What an incredible life; it reflects a century of Italian history. I lived in Naples in 1969, and I swear I saw Graziella there; I suspect, however, that I’m just combining my own memories with the images and words from this lovely book, because by that time Graziella would have been 105. At any rate, thinking of taralli always makes me think of her; you can see the massive ones she sold in the picture above. If you want to try some of your own, I found a likely recipe at Lidia’s Italy. 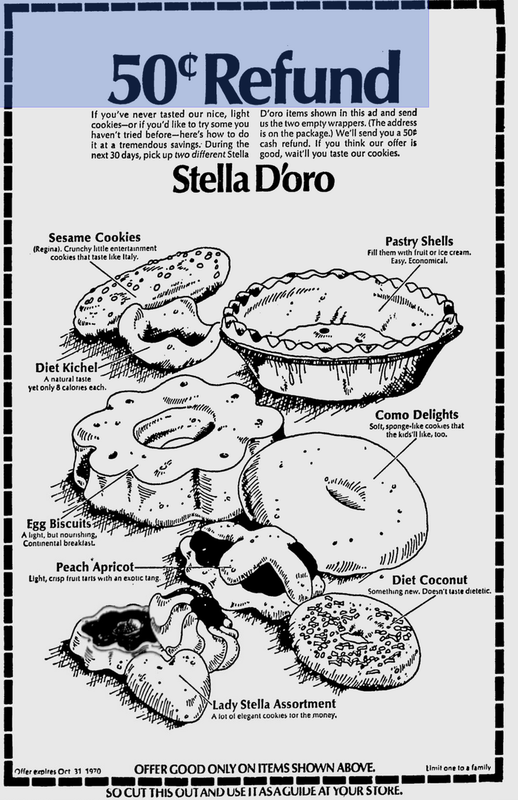 Please, Stella d’Oro, bring back your egg biscuits. 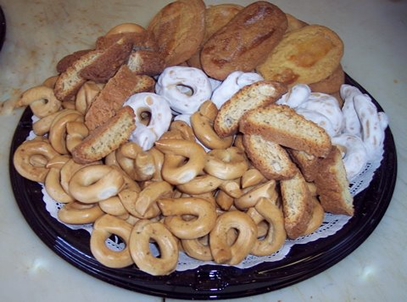 This entry was posted in Food, History and tagged Egg Biscuits, Italy, Stella d'Oro, Taralli. Bookmark the permalink. Oh my! The name of those Egg Biscuits has haunted me for years. I grew up on them. Ate them daily, my entire childhood! My whole family is deceased, and no one else I have asked remembers them AT ALL. 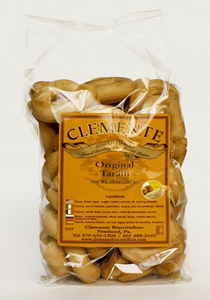 And, yes, I order the Clemente taralli because it is the closest taste and texture. Thank you so much for this validation! Please bring them back ! !my grandmother at Easter would put icing and jellybeans on them , yummy so good : a taste of my child hood! I even asked a Stello D’oro rep about these. I used to share them with my grandma! I wish they would bring them back as well. Light airy not alot of sugar and satisfying . Yessss!!! I loved those egg biscuits. I’d been looking for a long long time. Please bring them back!!! Stella D’ore bring back your old Egg Biscuit. Love them. Best cookies ever. I miss those frosted and U.N. frosted egg biscuits. My kids even loved them! Pleeeeese bring them back!!! OMG….I just recalled the lovely memories of my Baba always having these at her house. We would eat them with tea. Soooo, my quest was to find them, but to no avail. Gosh, I miss them sooo much.